Get out, Give back and travel with a purpose! We would like to thank all of the groups that participated in st udy and service trips this year. You are all an inspiration and make Andaman Discoveries’ purpose and mission exceed expectations. You help not only the communities in Thailand, but also spread the word on sustainable travel when you return to your countries. We hope that planting these seeds of meaningful stories and connections will allow for more people to travel with a purpose! We are so happy that you have become of apart of our story. Take a look at these driven groups and what they have contributed! Andaman Discoveries can customize programs for learning, service, cultural or personal objectives. If you are interested in these customized study and service trips visit our website and send us an inquiry. 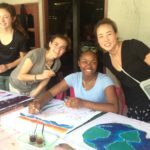 Coming back for the fifth year for their Community and Service work program the Hilversum school had been fostering relationships with the Burmese Learning Center and the homestay village of Ban Talae Nok. For the service project at the Burmese Learning Center, they built a sink for the students to brush their teeth, continuing the original teeth brushing campaign and sponsorship from Hilversum students 3 years ago. They also repaired and replaced doors, mirrors toilets in the bathroom and created garden plots for edible vegetables and fruit like papaya. They also fundraise for the Burmese Learning Center before their trip, contributing to the sustainability of the center so that future Burmese students have access to an education and a brighter future. There second service project was with a small mangrove conservation group that focuses on mangrove reforestation and also providing education to the local schools so the young generations learn the importance of mangrove conservation. 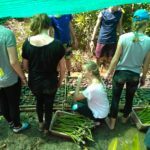 Hilversum students spent 2.5 days filling bags of dirt to plant mangrove saplings in the nursery, gathered mangrove saplings from the forest and re-planted them in the nursery and planted mature saplings back in the mangrove forest. 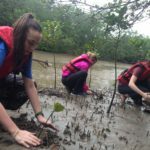 Over 2.5 days they were able to begin the process of reforestation for 800 mangrove trees. Hilversum also returned to Ban Talae Nok Village for come cultural integration. They made Thai snacks, fished on the beach, made soap, wove Nippa Palm Roof panels, took a trip to the white sand beaches of the Gam islands and of course, enjoyed delicious southern Thai meals with their hosts. What an amazing group of young adults from Chadwick school. 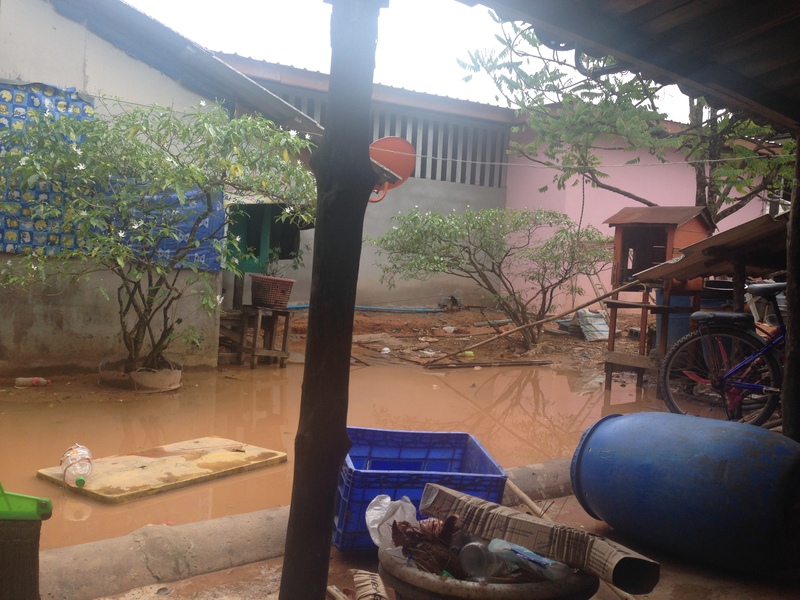 They participated in a 3D2N Homestay program in Ban Talae Nok Village. The students were able to travel responsibly and participate in culturally immersive activities like making a Thai snack, weaving Nippa Palm Roof Panels, fishing on the beach, making soap with the local women’s group(and using it during some monsoon rains), and traveling to the deserted Gam Islands for a lovely picnic on the beach. They also got soccer games going in the evenings with the local kids. This group of tourism students came to Thailand to learn about responsible tourism practices and how to run a community based Tourism Company and Foundation. They hiked the jungles of Khao Sok National Park learning about local flora and fauna from local guides, met with the student tourism team at Yaowait School in Khao Lak, participated in cultural activities in the Ban Talae Nok homestay program, joined the Moken Experience program on the Surin Islands and met with professors from the Phuket University to discuss tourism in Thailand. They were able to see all sides and types of tourism in Thailand by meeting with key players and also experiencing it firsthand. We are always excited to facilitate educational study trips that allow for partner learning and sharing learning objectives. “I liked that a Thai phrasebook was provided, it allowed for some basic conversation. I also like the relaxed attitude of the Thai people…to every problem there is a solution. We would like to thank Integral Travel for their amazing group this year who continues to show how patience, positive attitudes and sharing talents can break cultural barriers and plant seeds of friendship for a lifetime! Thanks to the massage group, the hardworking homestay group in Ban Talae Nok Village were able to receive massages and have a morning of relaxation and the youth learned a bit about massage and have been inspired to possibly start a Youth Massage Group. They also enjoyed a one day program with the Moken Tourism Team on the Surin Islands where their Moken guide led them on amazing snorkeling journey’s, taught them to weave bracelets out of forest Pandanus, row the traditional Moken boat and spear fish. We are happy to begin our collaboration and partnership with Crooked Trails. 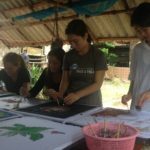 We were able to have a wonderful student group through them this year participate in a homestay program in Ban Talae Nok Homestay with a service activity twist. We planted 100 mangrove saplings to assist the community with the mangrove conservation efforts that began after the 2004 Tsunami. The students also enjoyed cultural activities like making Batik, soap and a tasty Thai snack. The cultural interaction came naturally to this group of young adults who were willing and anxious to interact and try speaking with their homestay hosts. This group truly travels with a purpose, the purpose of trekking for charity. They hiked an average of 10 Kilometers a day for 7 days, beginning at Cheow Lan Lake at Khao Sok National Park. They hiked throughout the day and then set up a camp with hammocks and food cooked out of bamboo in the evening. Then, they met our Andaman Discoveries staff for an overnight at Laem Son National Park before beginning their coastal hike from the National Park to Ban Tale Nok Village, where they were able to participate in some fun cultural activities. 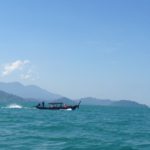 Their last stretch was from the Northern tip of Koh Koh Kaew Island to the Southern Tip. The charity hike supports Ban Nam Kem Nursery and they also donate a portion to the Burmese Learning Center. We are always inspired by these generous travelers and look forward to their return next year.